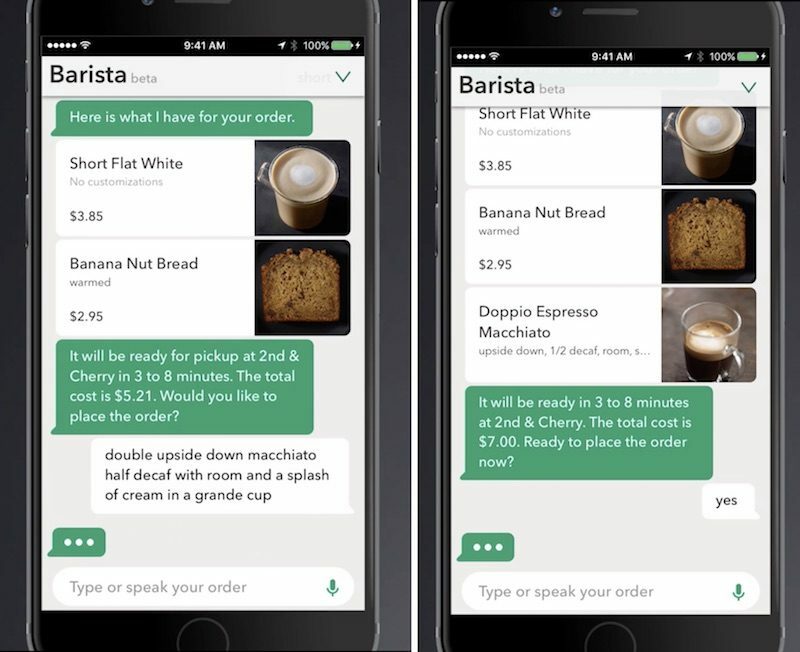 Starbucks today launched a limited iOS beta test for a new artificial intelligence assistant called "My Starbucks barista," which will let customers order their favorite menu items by speaking with a virtual barista within a new messaging interface in the company's mobile app (via TechCrunch). If they choose to, users can also opt to simply type their order to Starbucks, similar to chatbots that have become popular in apps like Facebook Messenger. My Starbucks barista will ask to confirm the pick-up location for the order and can help customers through the payment process as well, leaving them only needing to pass by their local Starbucks and pick up their order when it's ready. Additionally, a new "Starbucks Reorder Skill" is being implemented for Amazon's Alexa devices, giving users the chance to simply say, "Alexa, order my Starbucks" to reorder their usual items. The process requires the Starbucks app to be installed, with an account already in place that includes a designated favorite order. The Starbucks app has increased in popularity over the years thanks to its ability to let customers place orders online and arrive in the store to receive their drinks and food at the pick-up counter. The practice has become so popular in some locations, however, that customers have been known to leave when faced with long wait times. To fix the problem, Starbucks has begun hiring online order-only baristas, as well as testing out text notifications that alert customers when to arrive at the store. The beta test is currently beginning, but is limited to a small set of 1,000 iOS users in the U.S., with "a phased rollout" estimated to begin on a larger scale this summer. An update to the Android app is said to come later in 2017. Innovation is cool, but SBX should start with making good coffee first. It's very silly. You have to "reload your starbucks card" before you can pay in the app. Why can't I just pay you directly for the coffee instead of paying you for a virtual card which I then use to pay for the coffee? The Starbucks app has increased in popularity over the years thanks to its ability to let customers place orders online and arrive in the store to receive their drinks and food at the pick-up counter. Uh, no. The app is popular because it's the only way to earn stars. Or at least without carrying around a special card in addition to my phone and normal credit card. My local starbucks is terrible at handling mobile orders. Without fail, it is literally always quicker to show up, order in line, and receive that order than it is to wait at the mobile pickup counter to receive an order placed ahead of time. Innovation is a vapid over-used word. Kinda like "deflection". I get breakfast there every morning. Sous vere eggs. They are amazing. I make my own tea to go with them when I get to work. I can't wait to be able to just shout at Alexa on the way out the door in the morning.